Nowadays, street lighting systems in industries or cities are growing rapidly. The important considerations in the field of different technologies like electrical and electronics are cost effective, automation and power consumption. There are different street lighting systems are developed to maintain and control the lighting systems. These lighting systems are used to control and decrease energy consumption. This article illustrates the street light that glows on detecting vehicle movement. Street light controlling is one of the most developing system in India to conserve the energy. 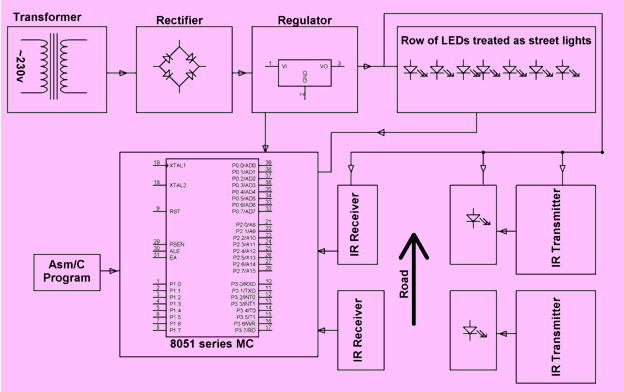 Generally, street light controlling system is a simple concept which uses a transistor to turn ON in the night time and turn OFF during the day time. The entire process can be done by a using a sensor namely LDR (light dependent resistor). Nowadays conserving the energy is an essential part and day by day energy resources are getting decreased. So our next generations may may face a lot of problems due to this lack of resources. This system doesn’t need a manual operation to turn ON/OFF the street lights. The street light system detects whether there is need of light or not. The proposed circuit is built with ATmega microcontroller, DS1307 IC, LDR, LCD, PIR sensor, Array of LED. This circuit is very useful in our day to day life like highways, real time street lights, the parking areas, restaurants and hotels. The working principle of this circuit is, when light falls on the light dependent resistor, then its resistance will be decreased, which results in an increase of the voltage at pin2 of the 555 IC. This 555 IC is inbuilt with a comparator, which associates between the i/p voltage from pin2 of the IC and 1/3rd of the power supply voltage. When i/p falls below 1/3rd then o/p is fixed to high otherwise it is fixed to the lower. 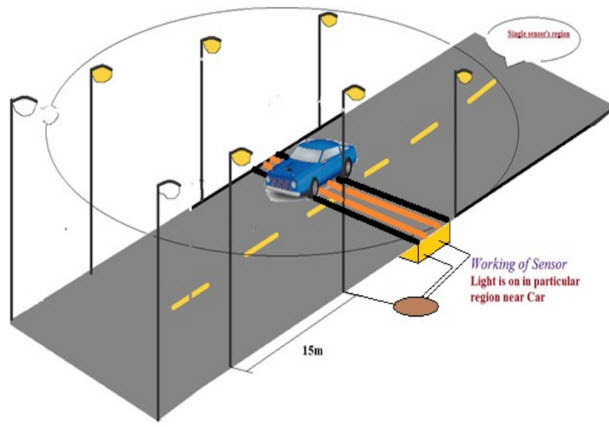 This project is used to detect the movement of a vehicle on highways or roads to turn ON the lights when the vehicle is ahead of the lights, and to turn OFF the glowing light when the vehicle passes away from the lights. By using this project we can conserve the energy. During the night time all the lights on the highway road remain on throughout the night, so the energy loss will be high when there is no movement of vehicles. This project gives a solution for saving the energy. This is attained by detecting an approaching vehicle by turning ON the street lights. As the vehicle passes away from the street light, then the lights get turn OFF. If there are no vehicles on the road, then all the lights will turn OFF. 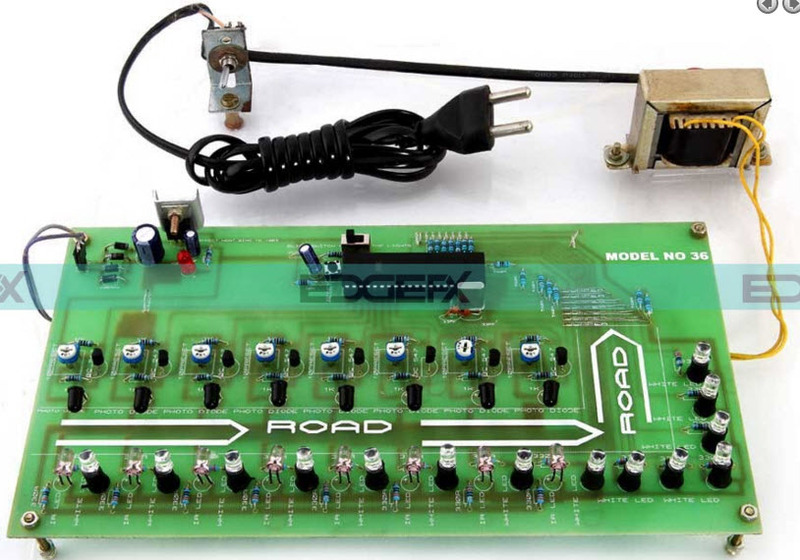 The infrared sensors are placed on each side of the road that are used to detect the vehicle movement and send the logic signals to a microcontroller (AT89S52 series) to turn on/ off the LEDs for a specific distance. Therefore, this way of dynamically switching ON and OFF the street lights helps in reducing the power consumption. The power supply of this project comprises of a step-down transformer, which steps down the voltage from 230v to 12V AC. This is transformed to a DC using a Bridge rectifier. A capacitor is used to remove the ripples using a capacitive filter, and it is then regulated to +5V from 12v using a 7805 IC voltage regulator, which is compulsory for the microcontroller as well as other components. Furthermore, this project can be extended by using suitable sensors for detecting the street light failure, and then sending an SMS to the control department through a GSM modem for suitable action. By using this project a lot of energy can be saved. The proposed system uses LEDs instead of other lamps. The project is especially designed for street lighting in remote rural and urban areas where the traffic is low at times. The system is multipurpose, extendable and totally variable to user needs. The applications of this street light that glows on detecting vehicle movement mainly involve in highways, real time street lights, hotels, parking areas and restaurants, etc. The advantages are; low cost, more life span and energy can be saved. Thus, this is all about street light that glows on detecting vehicle movement circuit and it working. We hope that you have got a better understanding of this concept of the information which we have given in the above.Furthermore, any queries regarding this topic or microcontroller based projects, please give your valuable suggestions by commenting in the comment section below. The project is very good. if instead of vehicle any man or animal suffer by the road then lights are on or off ? I want these parts ? yes, it works properly. we have developed a prototype project for engineering students. Which ray is used to detect a particular object with reflector with distance about 5 to 8 m.
What would happen if some vehicle​ is on the way in where we implement the IR sensor , or it got stopped there, what would happen if the LED will glow continuosly ? I sincerely appreciate your kind response regarding my article. the LED will glow continuously until the vehicle is present at IR sensor. Can u plz give me a asm or c code plz…..its urgent…. 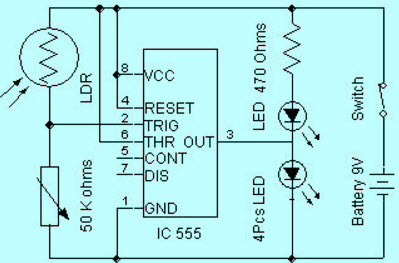 as we explained above circuit using ic555 is a manually operated circuit. if you want automatic we have to use a special microcontroller based application. what will the implementation cost for a specific range of area? does it will work effectively on during the rainy days? The project sounds really good. I’m studying second year B.Tech in Electronics and Communication Department. I want to work with this project. So, can I get further details of this project and also the coding part. Hi tarum Agarwal it’s a nice project. I’m eager to do this,so can you send the full details of apparatus or components required to make this. Please give me new idea to save more and more energy in street light that glows on detecting vehicle movement like automatic further intensity concept and what will be next. Is this a latest one!? If yes please let me know.. Yes, It is the latest project.